People pass the word only to those they trust mostcoming. They've been reading a mysterious book and memorizing its directives. 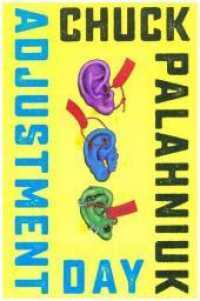 They are ready for the reckoning.Adjustment Day, the author's first novel in four years, is an ingeniously comic work in which Chuck Palahniuk does what he does best: skewer the absurdities in our society. Smug, geriatric politicians bring the nation to the brink of a third world war in an effort to control the burgeoning population of young males; working-class men dream of burying the elites; and professors propound theories that offer students only the bleakest future.Into this dyspeptic time a blue-black book is launched carrying such wisdom as:Imagine there's no God. There is no Heaven or Hell. There is only your son and his son and his son and the world you leave for them.The weak want you to forgo your destiny just as they've shirked theirs.A smile is your best bulletproof vest.When Adjustment Day arrives, it fearlessly makes real the logical conclusion of every separatist fantasy, alternative fact, and conspiracy theory lurking in the American psyche.